Convert DVD to iPhone 5S and enjoy latest DVD films on iPhone 5S freely with NO.1 DVD ripper! Praised by masses as "Same look, small screen, big potential", iPhone 5S was released on September 20, 2013. Being the fastest and most advanced Apple smartphone to date, iPhone 5S incorporates the next-gen 64-bit A7 processor and M7 motion-tracking chip, delivering an improved camera and a nifty fingerprint sensor, though bearing some hallmarks of its predecessor, the iPhone 5. IOS 7 adds some nice step-ups too. Why We Need to Convert DVD to iPhone 5S? Now people are fascinated by this all-conquering device, which can hold up to 80 hours of video. iPhone 5S doesn't have the ability to directly transform and play DVD videos. So if you want to take your high quality movies with you on the road, you need a utility to help convert DVD to iPhone 5S friendly videos, like MPEG-4, QuickTime, or H.264. You may go in quest of various DVD converters and finally scramble your mind. Instead of seeking for a needle in a bottle of hay, it's advisable to consider a top-notch DVD ripper. In this respect, WinX DVD Ripper Platinum is easily the best solution for you. It is a software program, which facilitates copying the content of a DVD to all sorts of devices including transferring DVD to your iPhone 5S. You will enjoy a super-easy DVD to iPhone 5S conversion process with it. Aside from that, first-class decryption technology and high speed are two eye-catching features of it. What is WinX DVD Ripper Platinum Able to Do? WinX DVD Ripper Platinum can easily rip any DVD to prevailing videos (namely MP4, MOV, M4V, etc.) and to convert DVD videos to iPhone 5S without sacrificing any video quality. Besides, this DVD converter supports Multi-core (up to 8) CPU and Hyper-threading so that you can enjoy the incomparably fast converting speed when putting DVD to iPhone 5S, iPad, iPod, etc. Furthermore, with the aid of High Quality Engine and De-interlacing Engine, it can considerably enhance the output DVD video quality. It also has a Mac edition. 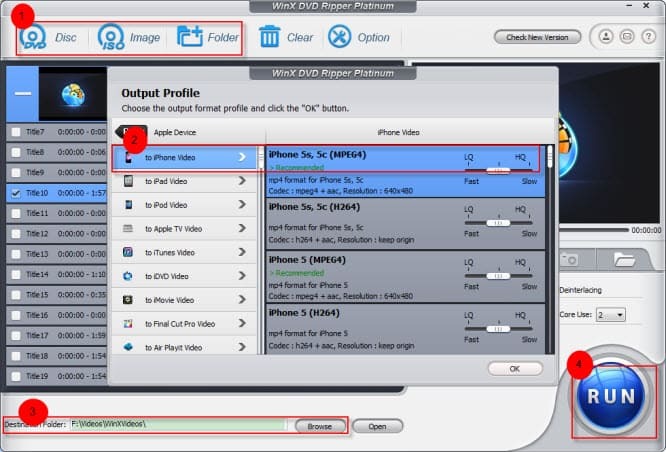 How to Convert DVD to iPhone 5S Video? Step 1. Download this program, install and launch it. Then click "DVD Disc", "ISO Image", or “Folder" to load a DVD. Step 2. Choose the output format for iPhone 5S from Apple Device based on the pop-up Output Profile windows. Step 3. Make some personal settings based on your needs, such as changing the default destination folder to save the output file. Note: It allows you to customize all video audio parameters. Subtitle is disabled by default, but there are multiple languages for you to choose based on your need and you can add extra SRT, especially when you convert a Spanish movie while you are an English native speaker, etc. Step 4: Click "Run" button to begin DVD to iPhone 5S converting. You are able to view the conversion progress and can cancel the converting process anytime. What Additional Features Does WinX DVD Ripper Platinum Possess? On top of the functions mentioned above, this DVD ripper is also capable of removing any DVD copy protections and region locks so as to satiate your demand of ripping DVD to iPhone 6S/Plus, decrypt DVDs to iPhone 6/Plus, DVD to iPad Air/mini , as well as Android devices, e.g. DVD to Google Nexus 8 . More incredibly, it has the knack of copying full DVD to ISO image and full title or main title content to MPEG-2 file preserving the original video quality. It can satisfy your backup demands to a maximized degree.